Budget vary. To help you budget how you budget, you can now customize your Envelopes based on your pay period. You get paid every Friday, buy groceries weekly, and pay rent monthly. Now, you can save up for expenses that happen every 2 weeks, every month and even farther in the future. You budget and get paychecks every month. Now, you can focus on saving up for big expenses that happen every 2, 3, and 6 months, like car insurance. Get started and customize your Envelopes on the web. Need Help? Check out our Help Article to get started. P.S. We’ve been working on a side project to help folks pay off debt faster. Sign up to hear the latest about our little iPhone debt app. How can I change my current envelopes without having to delete them and start over? Create at least one Envelope in the More Envelope section. Then you can drag your existing Envelopes down to that section to change it to any period you want. Hope this helps! AWESOME!!! I’ve been wanting this functionality forever – but HOW do you do it? I just spent 20 minutes trying to figure it out. I change the “monthly” to weekly and they all go to weekly. I want some weekly, some monthly and some every 2 weeks. Good question! First, change your Primary period to Weekly. Then scroll down to the More Envelopes section to add an Envelope with a different period. You can drag your existing Envelopes to the More section if you want to change their periods to something other than Weekly. Hi Rory – Good question! 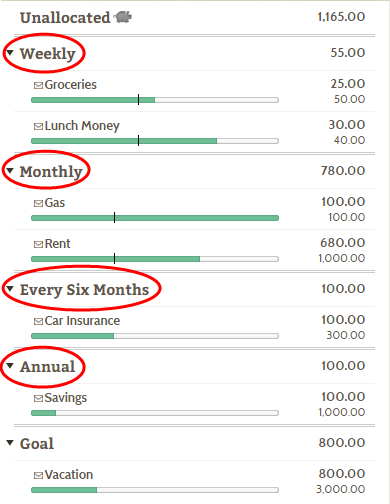 We are working on making the multiple budget periods feature view-able on mobile. We don’t have an official ETA on when this will be released, however. We’ll let you know when that changes. Thanks for this. Did have some issues trying to work out how to apply the change, but after reading the question, onto it now. Hi Adrian – Glad you were able to apply those changes! Let us know if you have more questions.